In the beginning, only cold pinpricks of starlight gave relief to unending darkness of the heavens. It was an empty place, with little life or spirit. Two great beings, the Drakori, considered the Dark Heavens their playground, and frolicked through the expanse with little heed or care. Darogo was fierce and gleamed a blinding silver. His consort, K’aeran, matched him in splendor and might. With no worries or burdens, they spent eons roaming the abyss in play and often spent entire ages wrapped in singularly-focused passion. Their love was pure. It never wavered, never fell into uncertainty. Each was the other’s existence without exception. All changed when new life grew in K’aeran’s belly. All of their passion had finally planted the seeds of a new beginning. They were overjoyed and frightened simultaneously. They knew nothing of rearing offspring. What would this bring? Neither were certain, but their first instinct was to find a safe haven in which to raise their future younglings. They came upon a place of rock and water, tucked away in a truly empty corner of the Dark Heavens. Settling upon this barren land’s quiet surface, K’aeran and Darogo rested and waited as the Lady Drakori’s belly swelled with impending life. After what would be centuries in the life of a mortal man, the Dragons were born. Unlike their parents, each was a unique, vibrant color. First born was Daranayta the Red. Next came Galantaegan the Black. They were followed by Antaunna the Blue, Remtagast the White, Syltankaran the Gold, and Oaukenterra the Green. The younglings brought a joy to K’aeran and Darogo they never imagined possible. Raising the young, who constantly played in the churning depths of the ocean or climbed the barren peaks of their chosen land, they learned to see beyond themselves. No longer did their own satisfaction or pleasure matter. They lived for their children. The six dragons grew as the stars wheeled overhead, but even after a millennia they were still young, only on the verge of entering maturity. Under Darogo and K’aeran’s guidance, the younglings learned how to use their powers to mold the surface of the land. They honed these skills upon the rock and water, but when allowed to frolic they took to the skies, sometimes skirting the threshold of the Dark Heavens. Never did they stray too far from home, and neither Darogo nor K’aeran entertained the thought of leaving this place. It had become their own. Truly was it home. However, the Dark Heavens were not entirely empty. Other beings sailed those shadowed courses. One such creature, vast and serpentine, equaled the Drakori in might and cunning. It slid from star to star, consuming all light and warmth in a constant need to devour. Beyond the consumption of life, it had no other purpose. No feelings of curiosity, compassion, or empathy. It was the Shadur’Wranth. Perhaps it was it was happenstance, perhaps the Shadur’Wranth hungered so greatly that it sensed the powerful souls of the Drakori and their young, but the shadowed being came to the crèche of the six dragons. The younglings were cavorting far from their parents, darting between the high, jagged peaks of a mountain range that burned with the fire of the deep earth. Evading each other, and the geysers of molten rock, was a favorite game of the young gods, but this would mark the last time they played amongst the fiery tors. Galantaegan was the first to sense something wrong, that something darker lurked amongst the ash and clouds that spewed from the earth. The most reckless of the brood, he broke away from the others and soared into the deeper mist. His older sister, Daranayta, saw him and followed. Delving through the roiling clouds of brimstone and char, Galantaegan did not see his foe until it was much too close. The Shadur’Wranth twisted leisurely towards him. Its oily scales were as black as Galantaegan’s, but the monstrosity was larger than he. The primal, unrelenting power emanating from the serpent fascinated and horrified Galantaegan. Before that moment he’d only felt that sort of power from one source, his parents. The Shadur’Wranth honed in on Galantaegan, gliding through the noxious clouds with alarming speed. Galantaegan knew, instinctively, that he was in trouble. The serpent bore down on him, and even when the Black Dragon released a torrent of flame the behemoth was undeterred. It opened its great maw, extended it fangs, and struck Galantaegan at the base of his neck. Instantly, the Shadur’Wranth’s venom paralyzed Galantaegan. His strength, his awesome power, meant nothing. He was helpless. The Shadur’Wranth coiled around the drake, released its fangs and unhinged its lower jaw, ready to consume the young dragon. Galantaegan was furious at his plight. Never had death seemed a possibility. Fear was an unknown. Nothing in his experiences had prepared him for this moment. As the stinking jaws of the Shadur’Wranth began to close around him, Galantaegan raged and rallied with his thoughts, but remained betrayed by his crippled body. A great, red blur flew past Galantaegan. It passed over the Shadur’Wranth, and the beast hissed and recoiled. It was his sister, Daranayta, and she was slashing at the serpent’s face with tooth and claw. It reared away from Galantaegan, loosening its coils, and screeched in pain. Its cry was piercing and echoed across the dragons’ world. Daranayta made another sweeping pass at the beast. She now had its full attention and it moved away from the Black Dragon, who fell to the mountainside below without the support of the beast’s twisting grip. It was a short distance, and even after slamming against the stone Galantaegan was able to witness the struggle. The Shadur’Wranth shrugged off another blast of flame, this one from his red sister, and closed in for a strike. Daranayta attempted to twist away, but Galantaegan knew it would be too late. The great serpent extended its fangs, issuing a triumphant hiss, but it never had the chance to land the blow. With silent fury, Darogo and K’aeran swooped down on the intruder, their silver bodies washing out the black of its scales. Unlike their young, the two Drakori equaled the Shadur’Wranth in size and power. Their claws tore deep gouges in its flesh and their flames burned away its scales. United, they were more than a match for the beast. The Drakori grew confident. K’aeran moved in for the killing blow, but the Shadur’Wranth launched one last, desperate strike and sank its fangs deep into her throat. It clamped down hard, pumping the entirety of its venom into her. The great Drakori cried out once and then became still as the venom took effect. With a final shake of its head, the Shadur’Wranth tore its fangs out of K’aeran, ripping away a large chunk of her flesh. As she fell away, Darogo did not even pause to bellow his anguish. He tore the Shadur’Wranth to pieces. Its blood steamed and hissed as it poured out of the creature’s body. Some of it sprayed onto Galantaegan and seeped into his wound. Darogo carried her through the skies and over the face of the world as his dragonlings followed. Remtagast and Syltankaran carried their stricken brother as, even though he was mended, his body was still sapped of strength. They came to rest in a sheltered valley of red and gold stone. As K’aeran laid her head on the ground she said, “This, my family, will be my final gift to you. When my soul leaves this body it shall go into the very heart of this land. It will take its first breath as life begins in its oceans and soil. With time, a great deal of time, this will be a vibrant, amazing place and you, my children, will be its keepers. Galantaegan said nothing, shedding silent tears. With a final whisper of breath, K’aeran’s life faded. Her soul, as she’d promised, left her body and seeped into the foundations of the world. K’aeran’s wish came to be. Her sacrifice gave life to the previously dead land. After many ages the world teemed with beings great and small. Birds filled the sky. Fish swam in the streams and seas. Deer ran through thick woods. Man and woman walked fertile fields and envisioned a world fashioned to their desires. Over it all watched the Six Dragons. And, from afar, Darogo kept vigil over his six children. He took his place in the distant sky, the pain of losing his beloved burning so greatly that he became encircled in a veil of relentless, raging fire. The inferno was wicked and violent, tortured and scouring, but allowed him to shine warmth and light onto the world that bore K’aeran’s spirit. He would stay by her side, forever her guardian, traversing heavens no longer darkened. 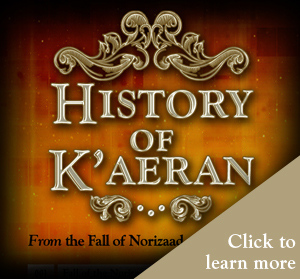 During the height of the Norizaad Empire all six of the dragons were held in the highest esteem and glory. 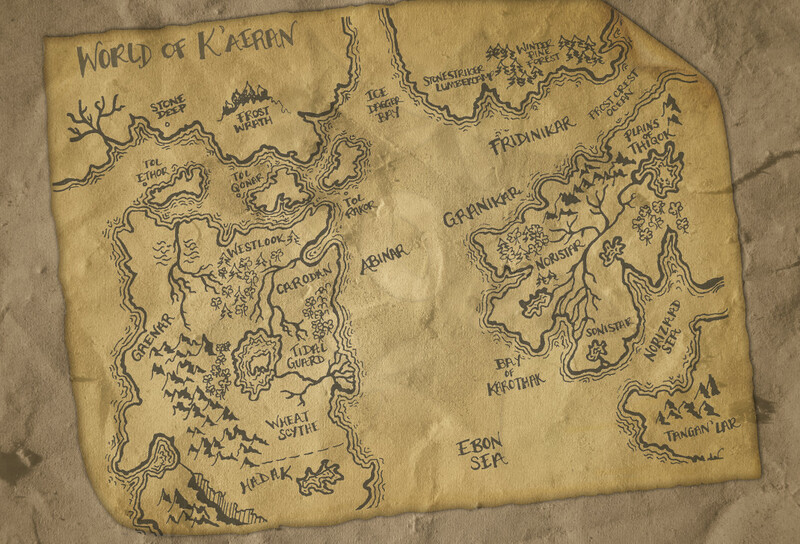 They were seen as a pantheon, each one representing a facet of life and the world of K’aeran. While current society sees only the active worship of Antaunna and Galantaegan, all Cardanans and Noriziem are aware of the other four dragons and what they represent. It is a reminder of their heritage, their lost glory, and the dangers of unchecked pride. Daranayta the Red – Representing the blood and soul of all living beings, she is the embodiment of life’s ability to persist in situations when it should not. She is the will to live, the drive to create new life. The instinctual love and need to protect that takes hold of each new parent is a gift given by the Red Dragon. Galantaegan the Black – His soul, forever scarred by the death of his mother and the blood of the Shadur’Wranth, came to embody chaos. In spite of our best plans, our best intentions, we are unable to foresee what truly lies ahead. He learned this in the most difficult way possible, and became obsessed with the unpredictability of existence. So often, all that remains of our passion and machinations after the turbulence of life are shadows and hollow wishes. It all crumbles to ash. He revels in bringing chaos to the lands of K’aeran for one simple reason: the pain that was brought down upon him would be brought down upon all. His loss would be shared. Antaunna the Blue – This gentle lady is tied to the oceans, rivers, and lakes. She is the balance in life, the ebb and flow that maintains equilibrium. Like water, she can be gentle and soothing or, if angered, relentless and crushing. Cardanans view their relationship with the sea and with her as one and the same. 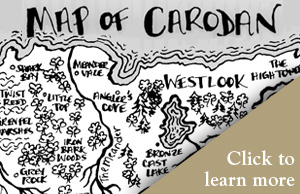 The sea can turn wicked with a moment’s notice, and take everything from a man, but in the end it always offers them its bounty and is key to the survival of Carodan. For everything lost, something is gained. Remtagast the White – The dragon of ice, he is as cold and white as the wintry wastes of Fridinikar. He is the absolute finality and mystery of death. The gatekeeper to the Hereafter, he is cold and unyielding, but not cruel. He knows what wonders and magic lie beyond this life, but they are secrets shared only with the dead. Syltankaran the Gold – The behemoth champion of flame, he is the embodiment of desire and lust. It is he who grants the passions that drive us, and in the truly great he bestows the relentless need to attain loftier and loftier goals. Those who hear his call the clearest, the kings, the generals, the heroes, must be careful for those burning brightest down the path of triumph may be consumed by ambition and fade away into ash. Oaukenterra the Green – The Lady of the Trees is her other name. All things green and growing are her children, and she represents nature’s persistence and ability to adapt. When the seemingly simplest forms of life endure in the harshest of conditions it is her will that makes it so. The faded remnants of the Norizaad Empire, the four Noriziem clans lead a harsh and bitter existence. 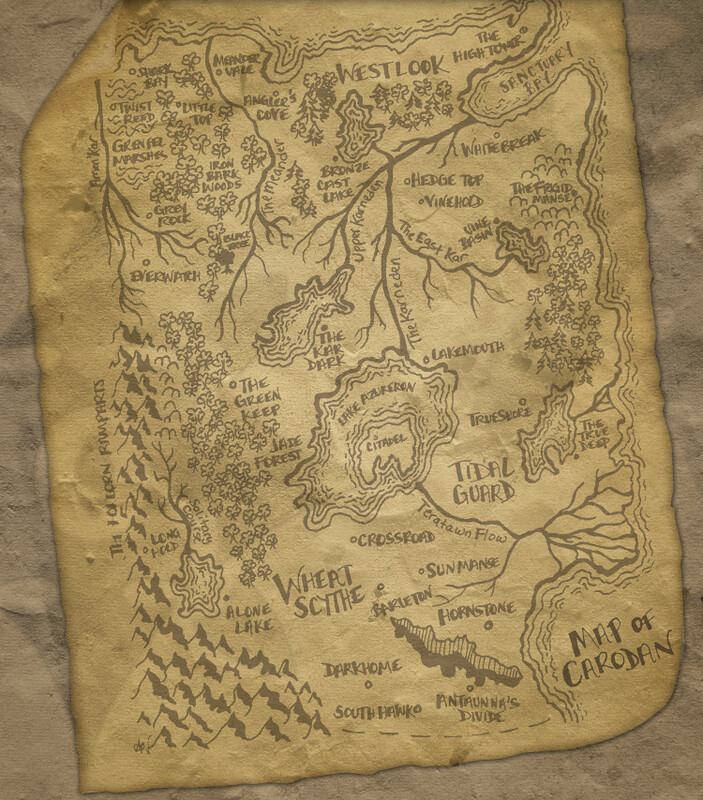 The old continent of Granikar is fallow after centuries of warfare. Agricultural resources are at a minimum, and the sections of Granikar that can support crops are hotly contested and often the cause of viscous bloodshed. As followers of Galantaegan, the Noriziem give themselves over to anger and passion easily. Chaos is inevitable and should be embraced. They make no excuses or apologies for their actions; life is a challenge, a contest, and only the strong survive. There is no room for pity, remorse, or second-guessing. They live every day to the fullest, whether it be a day for loving their families, drinking with comrades, or fighting their enemies. However, the specter of their former glory constantly haunts many Noriziem, and all four clans hold a deep-seated desire to regain the power of Norizaad. Clan Nathikan – A clan focused on war over all other aspects of life, the Nathikan are the most aggressive and barbarous of the clans. They are fearless on the fields, but their commitment to warfare has affected other aspects of their society. They have carved an existence out of the rugged and harsh land of Granikar’s northern coast, but they possess little infrastructure. Scoured and embattled over the centuries, the area has few resources and almost no agriculture. Nathikan live by pillaging, hunting in the forests of other clans, and gathering what little can be found in their home territory. Of all the clans they are most often in conflict, either with the other Noriziem or within their own ranks. War is in their blood. Their worship of Galantaegan is fervent and unwavering. They celebrate the most chaotic elements of the Black Dragon. As such, there are few permanent settlements in their lands, barring a few ancient strongholds that are used as safe havens in times of conflict. Otherwise, they are nomadic, moving often over land or by sea. To the Nathikan, this constant flux and change evokes the spirit and message of Galantaegan. One of the most striking elements of Nathikan life is how they approach intimate relationships. Every Nathikan man takes a wife when he reaches the age of eighteen. As a race of warriors, they recognize the need to replenish their numbers. While marriages can turn into unions bonded by affection, they are a practicality. Outside of the marriage, members of Clan Nathikan are free to take lovers, any number, man or woman. However, as Nathikan they are not allowed to display intimacy or affection in front of others. They cannot kiss, embrace, or even allow a lingering touch. Only behind closed doors, or at the very least a lowered tent flap, are they allowed closeness. Love can be shown to children when they are small, but when their young reach their thirteenth summer, and enter the beginnings of adulthood, they are bound by the same rules as adult Nathikan. As warriors, they can show no weakness. Against an enemy, revealed love for another is a chink in the armor. They eliminate that possibility. Clan Lobrenth – More refined and socially developed than the Nathikan, Clan Lobrenth’s lands are filled with forests and well-maintained fields. As such, they have warred with the other clans often. Their cities have stood for hundreds of years and rival Whitebreak and Citadel in size and grandeur. They are still aggressive, and will mercilessly persecute those who cross them, even members of their own clan. The harsh realities of existence on Granikar, and the brutal fallout that resulted from the collapse of the Norizaad Empire, turned most people to the worship of Chaos. The Lobrenth are no exception. They are not as enthralled with principles of Chaos as the Nathikan, but practice the religion more because they feel Galantaegan granted them the means and power to survive The Long Night that followed the fall of Norizaad. They feel indebted to the Black Dragon for their survival and prosperity. As a result, they will go to great lengths to maintain favor with Galantaegan, even waging a distant war against the heretical Cardanans. An interesting stratification exists within Lobrenth society that is not seen in the other clans. The lowborn of the Lobrenth are free to live as they wish. The Highhouse ensures they are supplied with drink, tournaments, and constant opportunities for battle. They remain satiated and completely loyal to their rulers. However, those of Highborn blood are held to different standards. They are supposed paragons of virtue. The Theurgy of Galantaegan had long ago established edicts by which the Highborn must live: Drink only in small amounts, carry oneself with constant dignity and restraint, worship upon the alter of Galantaegan daily, and only men and women may lie together. For men to be with men, or for a woman to love another woman, is an unthinkable sin. These laws are enforced by the soldiers of the Theurgy, the Galan-tora, with ruthless efficiency. No one, not even the blood kin of a Khan, are exempt from these edicts. All must follow the will of Galantaegan, and the Theurgy. 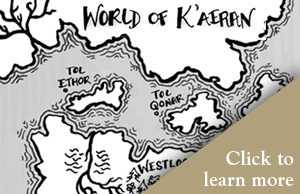 Clan Thent – Reclusive and xenophobic, Clan Thent hates the other clans almost as much as they do the Cardanans. They stay locked behind their borders, only emerging to protect their interests, conduct raids on Lobrenth farmland, or avenge any perceived slight upon their honor. An extremely marshal and hierarchal society, their code of honor is somewhat similar to that of the Grenar, but lacks the spiritual and natural balance of the non-human race. The Grenar recognize and acknowledge the strength of those who best them in battle. Clan Then does not, convinced of their superiority over all others. They believe themselves an instrument of Galantaegan, and exist for the singular purpose of spreading Galantaegan’s chaos across the surface of K’aeran. They feel beholden and indebted to the Black Dragon because it is their belief his powers and favor allowed their survival of the plague that decimated the old empire. Currently led by Khan Toral, Clan Thent has made several major moves in the last several years. They’ve acquired new lands from smaller, disparate tribes that still inhabit Granikar and sought to gain parity with the Nathikan and Lobrenth. An alliance has been forged with the smallest clan – Wathiem. More merchants than warriors, the Wathiem recognized that if they provided goods and trade to the stronger, more powerful Thent they would be granted its protection. In agreeing to the alliance, and the attack upon Carodan, Thent hopes to fulfill its obligation to Galantaegan and earn his favor. Khan Toral envisions a day when both the old world of Granikar and the new world of Abinar are united under a singular rule – His. Clan Wathiem – Friends to none, and allies of convenience to all, Clan Wathiem has carved its place in Granikar not with the blade but with coin. Master traders and bargainers, their culture is focused around the acquisition of wealth and material goods. The Long Night took an even greater toll on the Wathiem than the other clans. Their nature as traders made contact outside of their borders quite common. As such, the plague hit their population hard on several occasions. They always managed to recover, but now have the smallest population as a result. While their society is predominantly ruled by trade barons and merchant lords, Wathiem does possess a powerful military. Survival in Granikar mandates such. At times they have come into conflict with Nathikan and Lobrenth, and even more rarely Clan Thent. As geographical neighbors to Thent, Wathiem was well aware of the need to keep their larger and more powerful neighbor happy. Recently, they have officially aligned with Thent and provide a constant pipeline of food and wealth to the warrior clan. Currently led by Khan Logarsh, Clan Wathiem is intrigued by the opportunities presented in defeating Carodan. The heretics had built a vast and prosperous kingdom. Their fields produce huge amounts of grain, their mines precious ore, and the Cardanan population would sell well as slaves to both Noriziem and Hadari. Even though his goals conflict a bit with those of Morrikii Stonestriker, Logarsh is convinced he can build his mercantile empire in the wake of the impending war. Stonestriker’s new government would need money, and large amounts of it, to rebuild if Carodan was successfully conquered. Logarsh planned to provide that lifeline of currency, from a portion of his profits, and in doing so gain access to Stonestriker’s inner circle. He would ensure Clan Wathiem’s growth and prosperity, and, of course, his own.